O’Shaughnessy Estate is the project of Minnesotan Betty O’Shaughnessy, who prior to her Napa Valley adventure had a career in real estate investment and development followed by a stint as owner and teacher of a cooking school in Minneapolis. After falling for Napa Valley, she purchased a parcel of land in Oakville in 1990 where she built a home, then bought additional vineyards over the next decade on Howell Mountain (beginning in 1996) and Mount Veeder (in 2000). O’Shaughnessy's Howell Mountain Cabernet Sauvignon is actually a unique blend that can feature up to seven Bordeaux varieties. Beginning in 1997, O’Shaughnessy quickly planted 22 acres of Cabernet Sauvignon and another 2 of Merlot on her 60-acre Rancho del Oso property on Howell Mountain (the vineyard had been named by its workers for a black bear that occasionally visited the vines). She had the help and direction of Beringer’s long-time vineyard manager Bob Steinhauer, and used vine cuttings from Beringer’s own Howell Mountain vineyard, formerly known as Tre Colline (renamed Steinhauer Ranch in 2003). During the first ten years of fruit production, O’Shaughnessy sold Rancho del Oso grapes to Beringer, but that contract expired in 2009. In 1999, O’Shaughnessy hired winemaker Sean Capiaux, who had previously worked at Jordan, Pine Ridge and Peter Michael. Capiaux has made every vintage for O’Shaughnessy and now also serves as the winery’s president. The same year, O’Shaughnessy purchased the Amphitheater vineyard, adjacent to Rancho del Oso. Under the direction of Capiaux, she planted 17 acres of vines in this new site (out of a total of 40), the majority Cabernet Sauvignon but also including 6 acres of 7 additional historical Bordeaux blending varieties – Cabernet Franc, Petit Verdot, Merlot, Malbec, Carmenère, Saint Macaire and Gros Verdot. Rancho del Oso, which today is virtually all Cabernet Sauvignon, features softer, porous tufa rock as well as a lot of hard lava rock that had to be dynamited before the vines could be planted. Amphitheater has lava rock and tufa as well as iron-rich volcanic decay. Both vineyards are quite exposed to the sun, essentially west-facing at the top of the hill. O’Shaughnessy further expanded her holdings on Howell Mountain by buying the 20-acre Osprey Vineyard (named after a family of ospreys that make their home there) in 2012 and planting 5 acres of Cabernet Sauvignon vines in 2014. 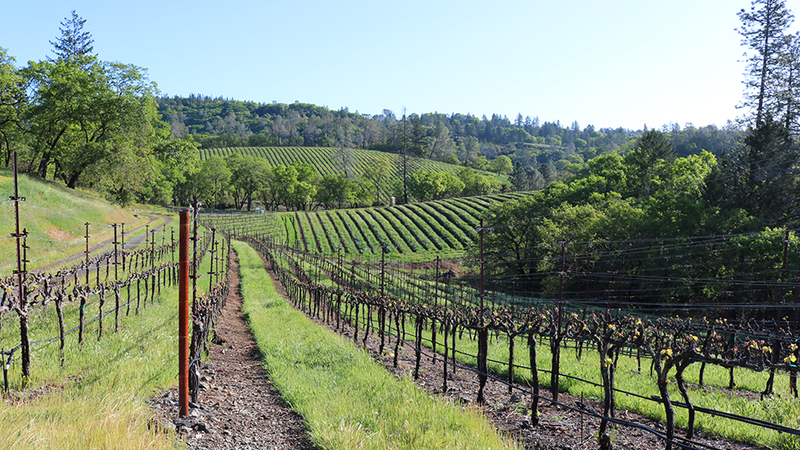 She now has about 43 producing acres of vines on Howell Mountain, at a high average altitude of 1,800 feet. O’Shaughnessy was a trailblazer on Howell Mountain, as there were only a handful of quality producers in the mid-1990s, among them Dunn Vineyards, La Jota and Beringer (on its Bancroft Ranch property). But a grape rush soon followed, as the region’s volcanic soils and its warm, dry weather, not to mention its high altitude above the fog line and its long sunshine hours from early morning until evening during the summer, proved to be ideal for producing robust red wines. 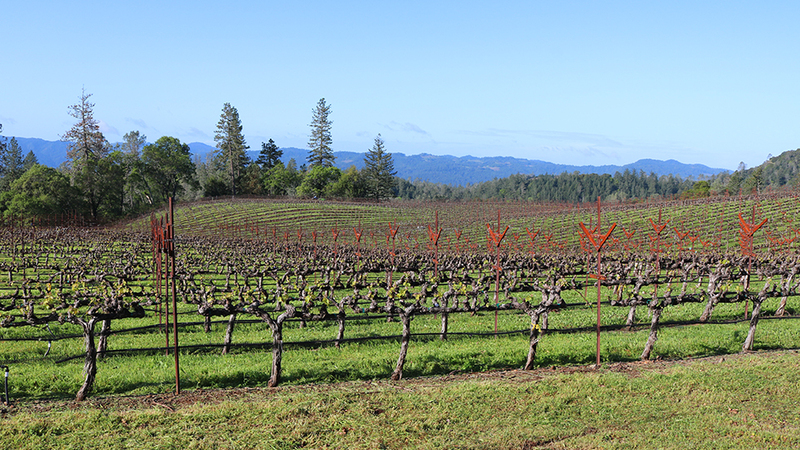 Howell Mountain, by the way, having been established in 1983, is the second oldest AVA in Napa Valley after Carneros. 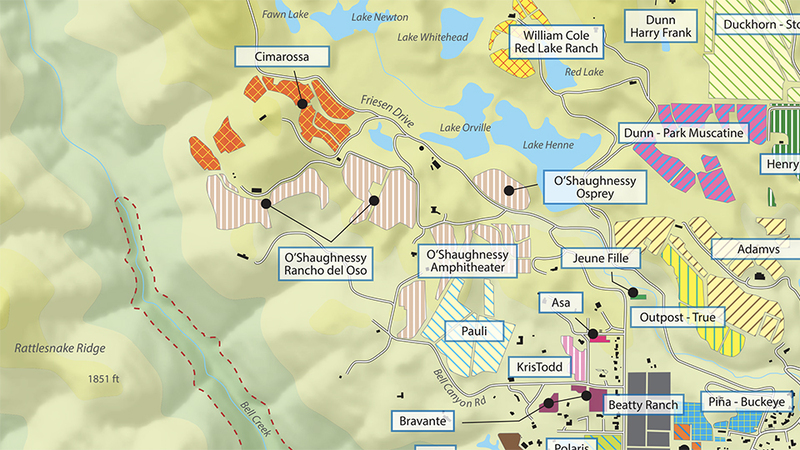 Excerpt taken from the Vinous Map of the Vineyards of Napa Valley – Howell Mountain, by Antonio Galloni and Alessandro Masnaghetti, © 2016-2018. I asked Capiaux what his original objective had been in crafting his new wine from Howell Mountain. He noted that Howell Mountain wines at the time tended to be big, tannic and rather rustic, and that he wanted to make a richer, riper, sweeter, more complex – “more contemporary” – style that was still representative of the area. He began with the idea of using the traditional five varieties of Bordeaux, but after doing extensive research on Bordeaux in the 19th century, he added a few more. 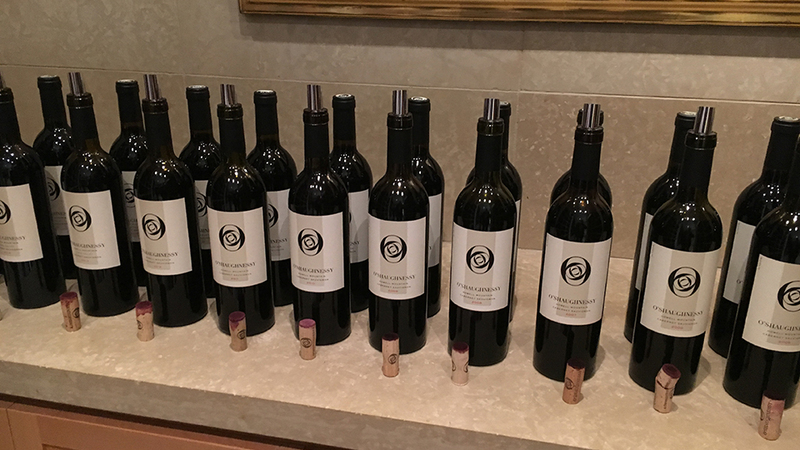 After vinifying the 2000 and 2001 vintages at Napa Wine Company in Oakville, O’Shaughnessy constructed a large semicircular cave and winery on the Rancho del Oso property in time for the harvest of 2002. She brought the barrels of 2000 and 2001 into her cave and bottled the wines there. The first O’Shaughnessy release was the 2000 Howell Mountain Cabernet, made from three-year-old Rancho del Oso vines. The thin, rocky, volcanic soils and sun-drenched site above the fog line routinely produce fruit with big mountain tannins that must be tamed. “The tannins are certainly our biggest challenge,” noted Capiaux. “When we started, we were aware that wines from Howell Mountain tended to get rustic and dry out. We wanted to make a wine true to the region but also rich, unctuous and sweet, and from the start we used blending to achieve this objective.” At the beginning Capiaux used some gently extracted Merlot to add color and soften the middle palate without compounding the wine’s tannic load, but “we also asked ourselves what the historic pre-phylloxera varieties were in Bordeaux.” One by one, the additional varieties planted in the Amphitheater vineyard were added to the blend, and the 2004 was the first wine to include all seven varieties (the estate’s tiny quantity of the prolific Gros Verdot has never made it into the blend). Capiaux practices minimal-intervention winemaking. The estate’s harvest on Howell Mountain typically begins in mid-September with Merlot, and Malbec next. The bulk of the Cabernet Sauvignon is picked in early October, with Carmenère and Saint Macaire coming in during the second half of that month. The fermentation occurs in stainless steel fermenters, and total time on the skins is typically 10 to 14 days. Capiaux starts with a four-day cold soak, then heats the tanks to begin the fermentation on the fifth day. The fermentation itself takes about a week. While the wine is fermented with indigenous yeasts 90% of the time, Capiaux will occasionally use some cultured strains to shorten skin contact – in 2011 due to the possibility that some rotten grapes remained following careful sorting and in 2017 in an attempt to minimize smoke taint from the early-autumn fires that plagued the North Coast. “Our sweet spot is alcohol in the 14.8% to 15.2% range,” said Capiaux, “and finished pHs are ideally 3.7 to 3.8 following moderate acidification.” Beginning with the 2013 harvest, the estate has used an optical sorter, which Capiaux says does a much better job of eliminating both green berries and raisins. He ages his wines in about 70% new oak, using coopers that he says give “complementary texture but not a ton of extra tannins” (his preferred suppliers are Sylvain, Buttes, Taransaud and Demptos). Capiaux carries out a total of four or five rackings, then bottles the second of July or August without fining or filtration. Not surprisingly, in light of the multiple parcels and varieties that go into the Howell Mountain bottling these days, Capiaux considers blending to be crucial to the wine – and to its consistency of quality. At the same time, he believes that with increasing vine age, the Howell Mountain wine has been showing a more pronounced place character as well as greater definition in recent vintages. Annual production of the Howell Mountain Cabernet began at around 800 cases but has grown in increments through the years and will eventually reach about 4,000 cases. Of course, since the early ‘00s, O’Shaughnessy has also offered another Cabernet from her vines on Mount Veeder, which has attracted a following of its own. According to O’Shaughnessy, Mount Veeder poses a similar challenge in terms of managing tannins. But the two mountain wines are also quite different. “Howell Mountain shows more leather, tobacco and chocolate elements,” she explained, “but the Mount Veeder wine, which is not a blend, is more about intense, dark Cabernet Sauvignon fruit. In 2014, for example, the Howell Mountain bottling was more approachable at the beginning but in other years it can be the other way around.” Both wines, needless to say, are capable of rewarding extended cellaring. 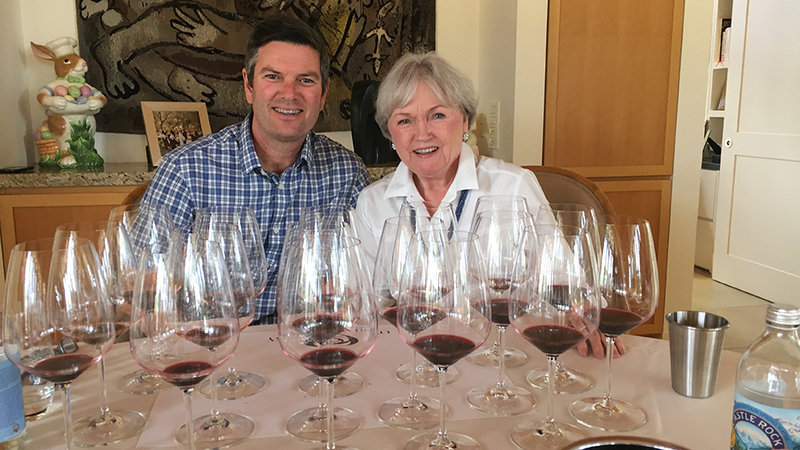 I tasted the full line-up of the Howell Mountain Cabernet at O’Shaughnessy’s home on the Oakville Crossroad, where she lives with her second husband Paul Woolls, a lawyer also from the Midwest whom she originally met at a wine tasting in southern California. 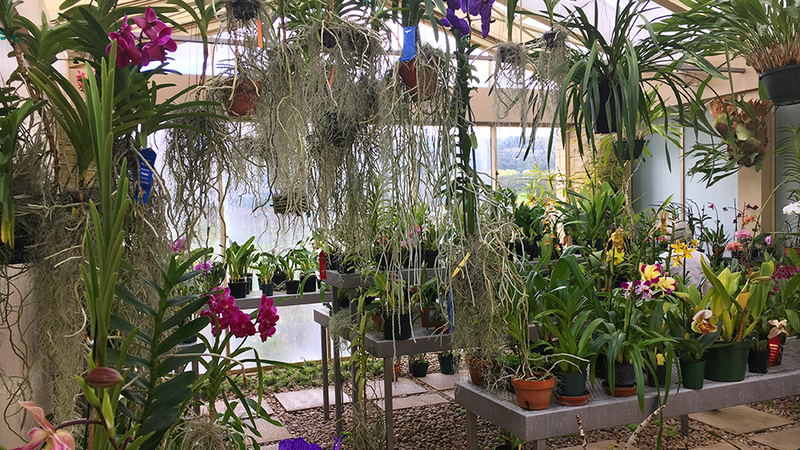 Her house is surrounded by 32 acres of vineyards and is also the site of her second hobby: a greenhouse in which she raises prize-winning orchids.